What Is The Best Cheap Road Bike For A Heavy Rider? It may not have snapped, but I am pretty sure it sagged. As a low-impact exercise, bicycling offers one of the best ways to lose weight while still protecting your joints. It is also easily accessible. You simply get on it and start pedaling. Many communities offer paved bike paths which provide safe spots to ride while staying away from traffic. Minutes turn into hours and hours turn into days and days turn into lost pounds as the calories melt away. The sport also offers greater enjoyment than many other workout programs. The wind in your hair and changing scenery provides a unique workout and provides more variety than endless hours on the treadmill. And, if the benefits of being a low-impact sport, that is easily accessible and not boring are not enough, the extroverts in this sport love how it connects you to a community. Throw on your helmet and show up at any number of the community rides your city holds each week. You’ll instantly make new friends who are also on the journey to greater health. All we need to do is get you on a bike that you feel comfortable riding. Generally speaking, it is expected that most bikes can hold about 300 pounds. However, even with that rating, there are some bike parts that may show excessive wear when regularly carrying a heavy rider. For example, the wheels on a bike are notoriously weak. A cheap set of wheels will regularly break spokes and need constant maintenance. It’s a major frustration and often pops up on riders who weigh as little as 180-200 pounds. The trick is to buy a bike that is made by a reputable brand to specifically carry heavier loads. Thankfully, there is a large group of riders who like to load their bikes down with heavy packages and tour long distances across the country. These cyclists have tested every configuration imaginable and the industry has begun offering bikes built to withstand this type of daily use. We’ll take some lessons from these touring bikes to provide the larger cyclists with tips on how to buy a bike that they will feel confident in. The first thing to look at is the bike brand. There are many cheap brands popping up. While they may sell a road bike for under $200, these bicycles tend to be excessively heavy and poorly made. To avoid frustration, it is better to invest in a reputable brand such as Diamondback, Raleigh, Tommasso, Trek, Giant, Cannondale, Specialized, Fuji, Kona or Scott (to name a few). It is better to buy a used bike that is a reputable brand than it is to purchase a new bike that isn’t. 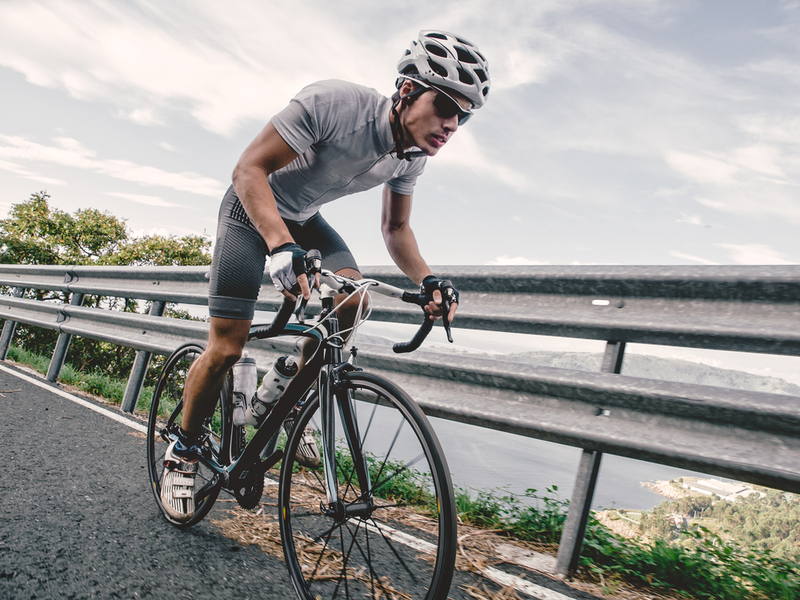 When you buy a renowned brand, you are purchasing a bicycle that has high-quality parts that can you can quickly repair. These well-built machines will give you confidence as you ride, and are, frankly, much more enjoyable as they pedal more smoothly. Road bikes come in a wide array of sizes. You’ll either see them measured in “Small, medium and large” or they will use inches or centimeters to describe the frame size. Most manufacturers keep a sizing chart on their website to make sizing easy. Just match your height to the correct size. This is critical. If you buy a bike that Is too small for your size, you will be miserable as you try to ride it. Many cyclists are in the “Big and Tall” category, and it is important to find those “X-large” frames that are tall enough to provide a comfortable ride. You might think that skinny road bike frame is suspect but it is actually the wheels which are the weakest spot of a bicycle. You can buy high-end wheels for about $200, however, if you shop carefully, you should be able to buy a bike that has more robust wheels already installed. A non-negotiable detail is that the rim of the wheel needs to be “double-walled”. This means that the rim has two layers of metal instead of one. This reinforced wheel design holds up much better than the single-layer design. Secondly, you’ll want to find a wheel with a high spoke count. The added spokes help to support the load and means that you will need fewer wheel repairs. Many times this is referred to the number of “holes” in the rim. If you can find it, a 32-hole rim is ideal. However, you should be ok if you can find a rim with 28-holes or better. When shopping used, you can easily count the spokes on the wheels. When shopping online, most bike manufacturers will offer specification sheets with a section for “rims” where they explain if the rims are single-walled or double-walled and what the spoke count. Road bikes with carbon or aluminum frames will hold up perfectly fine to the heaviest of riders. This should not be a concern, and many bike manufacturers warranty their frames for a minimum of 7 years. The frames aren’t usually the issue. However, steel frames tend to be attached to some of the most-durable bike parts. You see, steel is hefty. So when you are building a steel bike, it doesn’t matter whether or not the other parts are lightweight or not. As a result, many bike brands tend to use the more durable components on these bikes. Be sure to read the manufacturer’s specifications to make sure you are actually getting a more durable bike for your money. However, you can sometimes find a used touring bike. These bikes are designed to carry heavy loads for long distances. They are perfect for the rider who is worried about their weight. Electric bikes are beginning to pick up a following here in the United States. These bicycles tend to be expensive, but they are absolutely incredible. Now, you can pedal up those hills without getting off to walk the bike. These bikes still require you to pedal. So they force you to get that workout in. However, they can travel at a faster speed and they give you that extra boost to make cycling more achievable and fun. More cyclists are trying electric, and they find that they stick with the sport better. If cycling seems intimidating to you, look into electric bikes. Should You Get A Mountain Bike Instead? Often, people wonder if they should avoid buying a road bike and, instead, purchase a mountain bike since mountain bikes offer beefier frames. There are a couple of advantages to choosing a road bike. To begin with, they are designed to withstand aggressive riding. If you are cruising around your neighborhood, this is minimal risk that you will ever reach the maximum capacity of your frame. Additionally, mountain bikes tend to be much cheaper than a road bike. You can find high-quality mountain bikes for as little as $300. To buy the same level of a machine in a road bike version, you’ll likely invest about $500. If those two benefits aren’t enough, mountain bikes tend to have a more comfortable saddle. Now, “comfortable bike seat” is an oxymoron, however, road bikes have much narrower bike seats. Mountain bikes come with wider saddles, and you can even swap those saddles out for even wider ones if you need to, so you can get the support you need. Finally, mountain bikes tend to sit the rider in a more upright position. This is more comfortable for many cyclists, especially those with back problems. However, mountain bikes have the major drawback in that they are slower on the pavement. The wide tires and thicker bike frame plays a role in slowing down the cyclist. If you are wanting to ride with a pack of friends or plan on riding mostly on asphalt, you’ll be glad you spent the extra money and invested in a road bike. After all, road bikes are designed for heavy loads. They may not look like it, but they’ll support you. Hopefully, this article has made you more excited and confident about cycling. Welcome to the sport. May the wind be always at your back!